Israel In Prophecy » KeyIssues/How can Zionism be Christian?? How can Zionism be Christian? And they will rebuild the ruined cities and live in them; They will also plant vineyards and drink their wine, And make gardens and eat their fruit. And they will not again be rooted out from their land Which I have given them," Says the LORD your God. 31 "So you also, when you see these things happening, recognize that the kingdom of God is near. 32 "Truly I say to you, this generation will not pass away until all things take place. 33 "Heaven and earth will pass away, but My words will not pass away. 9 "And in that day I will set about to destroy all the nations that come against Jerusalem. 10 "I will pour out on the house of David and on the inhabitants of Jerusalem, the Spirit of grace and of supplication, so that they will look on Me whom they have pierced; and they will mourn for Him, as one mourns for an only son, and they will weep bitterly over Him like the bitter weeping over a firstborn. Our Conclusion: Christian Zionism does not see the Church replace Israel as do most Christian denominations till this day (see the evidence above from one of the biggest Cathedrals of Europe: On the right you see the triumphant Church proudly looking down on the rejected Synagogue on the left. 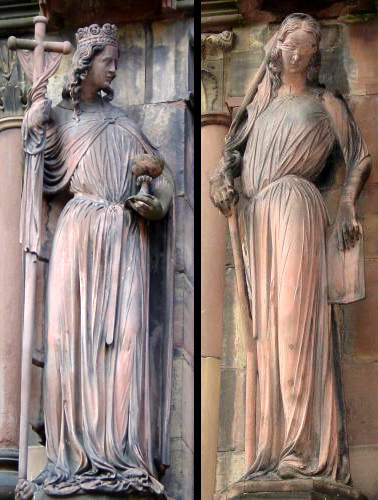 The two statues are allegorical sculptures decorating the East entrance of the Cathedral.) Christian Zionism is way beyond all Israeli politics. That kind of Zionism does not regard Israel as a nation of saints that never make any mistakes. Christian Zionism announces to Israel the salvation she needs. Sorry but the titles of the statues are obviously the wrong way round. The blindfolded figure losing it's grip on the Ten Commandments is obviously the Church whilst the triumphant beauty is obviously Israel renewed !! Geez, that's unbelievblae. Kudos and such. Yes I totally agree. Jesus Christ never said HE will bring a new "worldly name" religions but HE will bring a new way, a promise, a new testament. So in fact Jesus of Nazareth himself is a Jews but HE oppose the cultural practice on Jews and HE insisted to bring back the real real way to Jews, it is a spirit way. Islam himself are believed on this way but Islamic thinking always from worldly way. I can say when Christian thinking of Jews way from spirit paradigm then Islam thinking are opposite side, Islam thinking of Jews way from worldly paradigm. Both Christian and Islam were thought that Jews already soiled with human cultural influences.